The Scripts Manager dialog box lets you link a script to a toolbar button for quick and easy access. 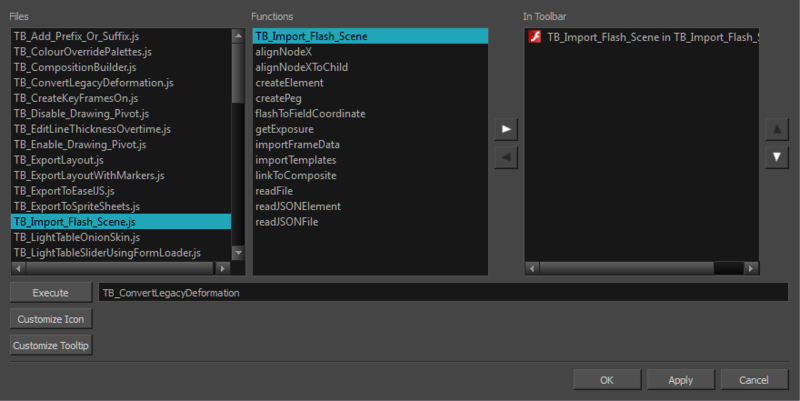 Once you select a script, you can add it to the toolbar, load a custom icon and add a tooltip. For tasks related to this dialog box, see Linking Scripts to Buttons. Adds the selected script to the toolbar. Runs the script you selected. Press Esc to interrupt the execution of the script. Lets you load a custom icon for the function. You can browse for a *.png, *.jpg or *.xpm file. Lets you type in a tooltip for the function. When you hover over the button in the toolbar, your tooltip will appear.